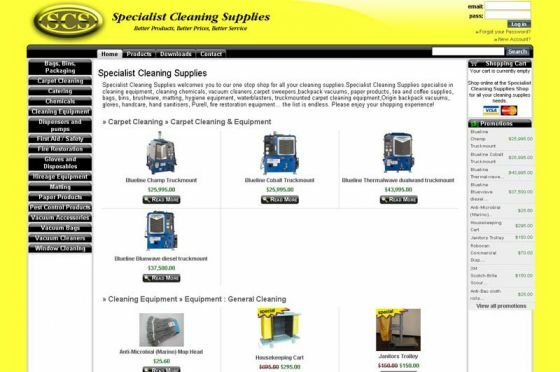 Specialist Cleaning Supplies (SCS) contracted Professional Development to create an online e-commerce portal for sales of cleaning products. To minimise workload and maintain consistency between online prices and point of sale (POS) prices, a simple process of importing data from their accounts package into the website was created. SCS can easily assign any product or category for promotion increasing sales potential. Full customer, products, categories, and orders management ensures that business can continue at all times. "From the start I found ProDev very professional and the system that they had created very simple to use. This was important, as my level of computer skill is minimal. The Website itself is very simple for our clients to operate and we received our first order from an unrelated source just days after we went live! The thing that has impressed me the most is the quick response I have received from John and his team when I have asked for features to be created specific to our needs. On several occasions I have made requests for specific features and within a week these features have been created and in use. I am very pleased."